Do you know your own strengths, values and gifts? It is likely that you have come across some discussion of strengths and values in your workplace, as it has become a common focus recently. Most of the discussion of gifts and strengths, focuses on how we use them to interact with the world, how we put them into practice in our work, lives or parenting. The wellbeing literature points to an association between the opportunity to use our strengths at work as being associated with greater well-being. So knowing and using our gifts can be an important step in our self-care to increase and maintain our wellbeing. After my last post about self-care, I have had various conversations about self-care including my own. On one level self-care is easy - most of us know the principles and have some ideas of the things that help us be healthy and feel re-energised. It is not lack of knowledge that prevents us from taking actions to care for ourselves. Other elements are at play that prevents us from prioritising self-care. Often it can be that we haven’t developed enough self-compassion, we may not value self-care, or prioritise our needs. It is much easier to achieve goals that are in line with our values and use our strengths and gifts. Yet most of the discussion around strengths focuses on their outward expression. 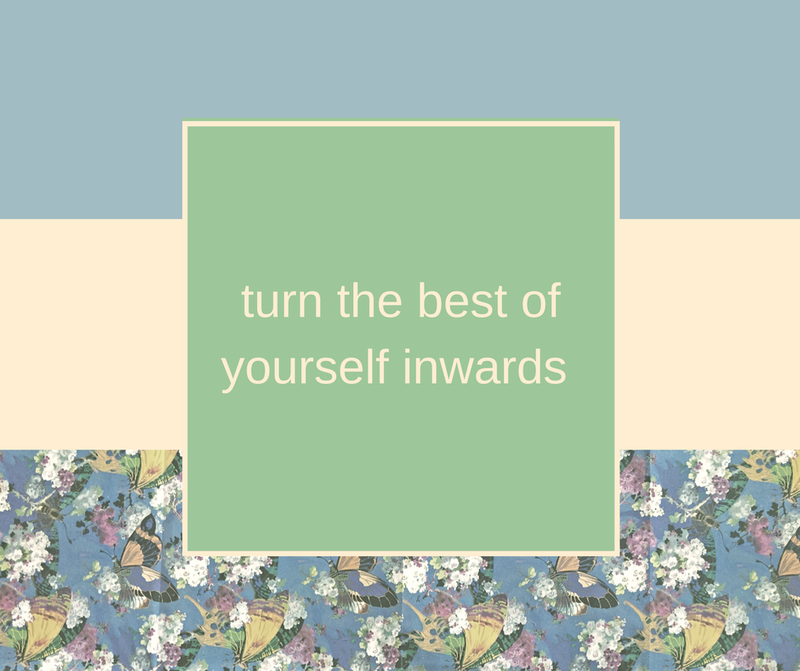 A step in becoming better at self-care is to consider turning the best of ourselves inwards. Self-care may become easier if we find ways to base our practices in what we value, and to mobilise our strengths and gifts in the service of our own well-being and self-care. The first step in this is identifying your strengths, values and talents. A good place to start is with the VIA survey that you can find here. Then think about your values and how they can underpin your self-care. For example, if you value honesty taking time, to be honest about how you feel about your work and your energy levels may be an important self-care practice for you. I place a high value on wisdom and I see part of wisdom as caring for myself well. Self-care will become easier if you take the time to base it in some of your core values. Think about how you can turn your gifts and strengths to yourself and your own care. We often overlook applying strengths and gifts to ourselves. The most obvious example comes from those I know and work with who have gifts of empathy and compassion. These gifts tend to be mostly focussed outwards, and it takes an intentional attempt at refocussing for them to turn that same level of empathy and compassion to themselves. Often people who are strong in communication and humour also tend to focus these gifts outwards, intentionally re-focussing these inwards may include journalling to communicate better with yourself, and doing things just for fun to express your humour rather than seeking to be making others laugh. I am trying to use my strength of curiosity to become more curious about what is going on in my own mind and to spend more time exploring my own emotional reactions to things as a way of increasing my mindfulness. Thinking about our strengths and how we can apply them to ourselves, not just others, is a key component of helping us to prioritise and value self-care. I have put together a weekly worksheet (also available as a pdf) to help you reflect on how your are and can use your strengths to care for yourself. At the end of each day reflect on how you used your strengths for others, what you did (or didn’t) do for your own self-care and think about how you could have used this strength to support and re-energise yourself. As always I would love to hear how you are using your strengths as a base for self-care. I spent two days last weekend at the Auckland Writers Festival. It is a highlight of my year, an event I look forward to and I planned ahead with work and parenting commitments so that I could attend. I enjoyed being around creative people, listening to them describe their creative process, hearing their passion for their work and their topics. I discovered new books and authors that I haven’t read yet, I met interesting people in the queue for the bathroom and I heard about new ideas. I left with my brain buzzing, making new connections and throwing interesting thoughts together. I left inspired and full of new ideas. If you are in a role that requires you to be creative or innovative it is wise to be thinking about how you keep your creativity flowing. You cannot treat your creativity like it is an endless stream that will keep flowing no matter how much you draw from it. Your creativity is precious and fragile and needs tending and nurturing with care. You need to balance output with input, to be thinking about how much you are drawing from your creativity and how much you are feeding into your creativity. If you neglect the tending and the input you may end up feeling like you are wringing the last drops of water from a dry sponge as you try to come up with your next idea. Part of my well-being practice is to pay careful attention to the effect that different people, different situations and different types of input have on my ability to be creative. I have discovered that certain people who have certain ways of presenting themselves and their ideas tend to shut down my thinking, they don’t stimulate my thoughts, and they leave me dry. Other people leave me bursting with thoughts, feeling inspired and creative, and wondering how I am going to implement all the ideas I am having. Creativity is a complex mix of personality, ways of thinking and the influence of others (including friends and colleagues). So to nurture my creativity I need to pay attention to the mix that is created around me. Part of how I nurture my creativity is to make sure that my life is balanced with lots of events and people that fire up my creative thoughts. Attending the Writers Festival is not a luxury for me but an essential practice for nurturing my creativity, and making sure that my ideas are still flowing. When did you last stop? No I mean really stop. Stop to do nothing. I don’t mean reading this blog on your phone while you wait for your coffee to be made, I mean actually stop. Life has been pretty busy lately and I was at the supermarket the other day waiting in the checkout queue. As I realised I was going to have to wait for 2 people in front of me instead of feeling impatient like normal I was actually pleased, it felt like a treat. You see for that moment all that was required of me was to wait, no-one was requiring anything from me (I do my shopping without my son) all I had to do was stand there. Waiting in the grocery queue was freeing and energising. This world that we live in cajoles us to keep going, to keep up, to keep thinking, to never quite switch off. We live in an information-rich age, which ironically increases our expectation to know everything all the time. Our devices with their dings, notifications, time to destinations, task lists and reminders, keep us aware of time, aware of all that we have to do, and the time that we have to do it in. Usually when I have to wait I am caught up in this trap, I might be checking on blogs I follow, checking my own blog stats, checking to see if anyone has messaged me, writing a list of things I have to do next, or worrying that I won’t have time to do the next things I am trying to fitinto my stuffed schedule. Our brains, just like other parts of our body need care, maintenance and compassion to stay in good condition. Part of how we care for our brains is to give them some down time. Some time when we stop putting information in and relax, letting our brain roam free. The downtime allows our brain to process all that we have put in, may assist it in storing memories effectively and being able to pay attention again when we need to. Downtime also helps us to create innovative solutions to those things we may be stuck on and helps our creativity. Our ability to think and concentrate is also enhanced by making sure we take regular down times throughout the day. Life micro-pauses are those opportunities that we have to take breaks during the day, those little moments in which we can detach from the demands placed on us, and relax our bodies and brains. The first step is to notice all these opportunities, and then to actually be intentional about using them to stop, as it is easy to fill them up with the noise of our connected lives. Think about how you can use the small pauses that occur in your day to day life as downtime for your brain. These can be those moments when you are waiting for the kettle to boil, or the coffee machine to heat up, waiting in the supermarket line, waiting for the lights to change, or in the queue at the post office. These are all times when nothing is required of you, all you have to do in that moment is to wait, to take a moment to rest your brain and rest your body, and simply be. You might like to be aware of your body or be aware of your breath, and you will need to be intentional about not filling these moments with your phone, magazines, music, the news of other inputs that you have on hand. Take these moments as opportunities to refresh and re-energise. "I don't feel like I can be myself", or "the young people don't feel safe". It is something I hear a lot, especially in the evangelical environments that I used to be involved in. There seems to be something about Christian (evangelical) environments that make it very difficult to create a psychologically safe environment. I mentioned psychological safety briefly on my blog last weekbut it is such an important concept for churches and organisations to discuss I would like to highlight it again. emphasis on ‘in’ and ‘out’ and the feeling of belonging is very (perhaps spiritually) important to members. Members may be reluctant to express themselves as the consequence is that they are labelled as non-christian or non-biblical, and their sense of belonging to the community is questioned. Psychological safety is necessary to encourage innovation and learning. If we want to grow the individuals in our churches and our churches ability to keep up with societal changes we need to create psychological safety. Leaders have a role to play in creating a psychologically safe congregation, but the research shows that the members have just as an important part in creating safety. Leaders can help by modelling how to value and appreciate diverse opinions, by acknowledging the diversity of opinions within Christianity and within their denominations. They can admit their own mistakes and doubts, and importantly they can model that the status quo can be challenged, and ask for input and feedback. Members then need to be taught how to value and respect other's opinions, and how to be accepting of others doubts and questions. As an individual it can be difficult to create a psychologically safe environment, but it is possible to gradually make some small changes. The first step is to take some small risks in sharing your own thoughts and ideas, this may encourage others to share as well. Here are some questions to get you and your leadership thinking about psychological safety. Is my church a psychologically safe environment for me? For others? Do the people in my church seem different in contrast to when I speak to individuals? 3) What are the ways in which we re-in force belonging over not-belonging and hold it as a threat for those who don't conform? 4) Does the leadership admit their fallibility, not just in their personal or spiritual life but acknowledging their blind spots and asking for input? 5) How do I express appreciation for others opinions? 6) What are the small risks I could take this week to express myself fully?